This VST-hosting modular construction kit would still be a monster bargain if it cost twice as much. Highly recommended! Excellent assortment of modules. VST plugin parameters modulatable. Some excellent prefab devices included. Very easy to use. Excellent value. Could use more generators. Mac users can only get it in MuLab. We've always been partial to modular plugin hosts - you know, the sort that enable you to string together instruments and effects in any way you see fit. We also dig modular synths, with their infinite options and flexibility. So when the two come together, we can't help but have high hopes - and come together they most certainly do in MUX from MuLab, developer MuTools. 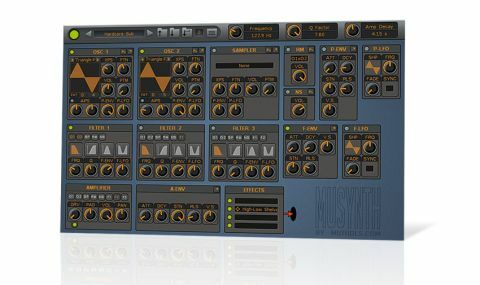 While MUX is built in to both the PC and Mac versions of MuLab, as a plugin to use in other hosts, it comes as a Windows- only VST plugin (with no standalone version). "MUX is built in to both the PC and Mac versions of MuLab, or a Windows-only VST plugin to use in other hosts"
Clicking a title-bar icon reveals the Deep Editor, a modules-'n'-wires interface that will be familiar to uses of Reaktor, Bidule, et al. Here you can insert new modules or VST plugins, and edit the ones already loaded. Some of those modules might be complete devices in themselves, revealing a yet deeper architecture beneath. In most cases, the factory devices can be reworked and re-patched into something new, making them good jumping-off points for your own creations. We say "most cases" because some, such as the superb MuSynth, are locked, and you can't open them in the Deep Editor at all. MUX comes with over 50 modules, not including the prefab instruments and effects. There's an analogue-style oscillator (although it's not limited to analogue waveforms) and a number of sample- based generators, ranging from simple looping (or not) sample players to a layered multi- sampler. "MUX has just about everything you need to create all manner of synths, samplers and effects"
Frequency-shaping is represented by a multimode filter module and an all-pass filter, and modulation options abound, with both analogue-style ADSR envelopes and multi-stage affairs. There's a glut of other effects modules, too, of course, with LFOs, 'wobble' processors and more onboard. The library is completed by various MIDI and effects processing modules. MUX has just about everything you need to create all manner of synths, samplers and effects. There are, alas, no dedicated additive or wavetable modules, but it's possible to kludge them together with effort. We should point out that when using a VST plugin in MUX, all of its parameters are made available for modulation by other modules, which is good news. Working with MUX is surprisingly intuitive. The interface is clean and clear, and mouse-over hints and right-click menus help you along. You might have to consult the documentation when using the most esoteric modules, but all in all, it's easy and rewarding to use. Once you've cobbled together a device, you can dress it up in a user-interface of your own design, making only the parameters you want access to visible at the top-most level. If you want to share your creation with others, they will need MUX too, though (ie, there is no 'export as VST' option). The sound quality of the raw modules is excellent across the board. If you need big, ballsy bass, MUX can do that. Screaming analogue waveforms? No problem. Ditto for ethereal effects. If you create a bad-sounding patch in MUX, well, that's down to you, not the program. MUX is a feature-packed bargain, even for those who don't want to get their hands dirty building their own instruments. MuLab have always done things their own way and MUX is no exception - it is, however, exceptional.